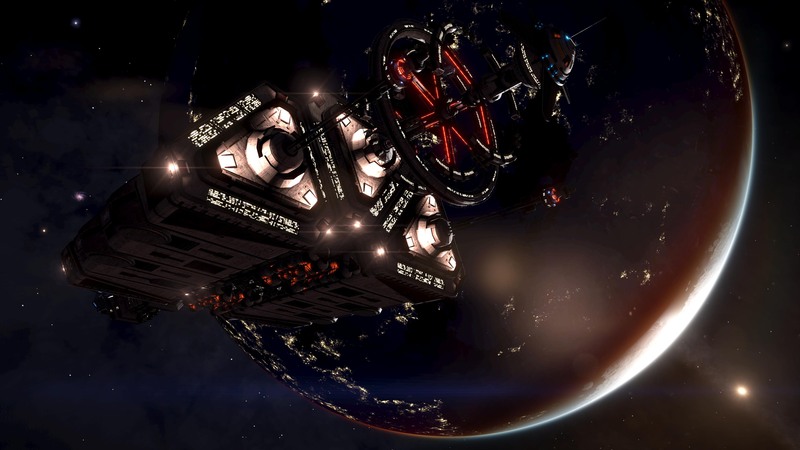 The Guardian Structure is a surface structure created by the Guardians. 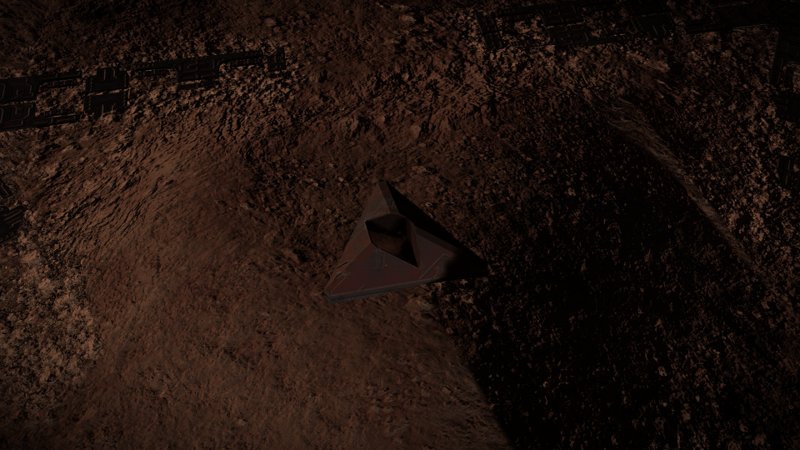 It was found after the less interactive Ancient Ruins (also created by The Guardians), and is often found in the same systems. 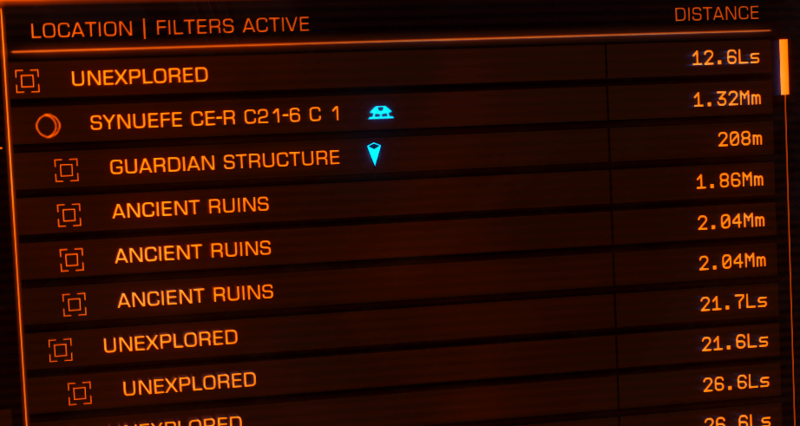 While several Ancient Ruins are often found in the same system we have only found a maximum of one Guardian Structure per system. 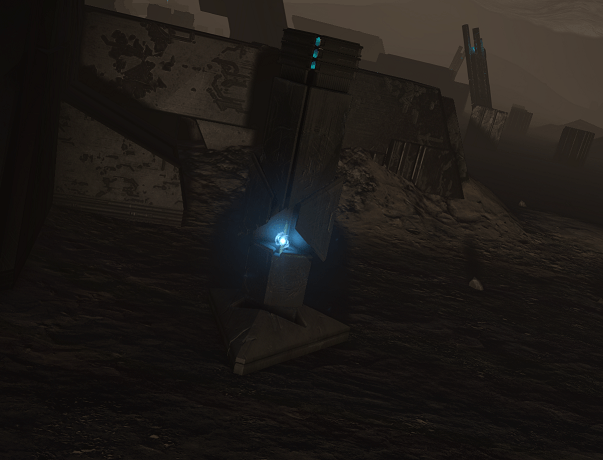 Guardian Structures have been found in the Synuefe, Col 173 and Vela Dark Region area – near the permit locked Regor sector. 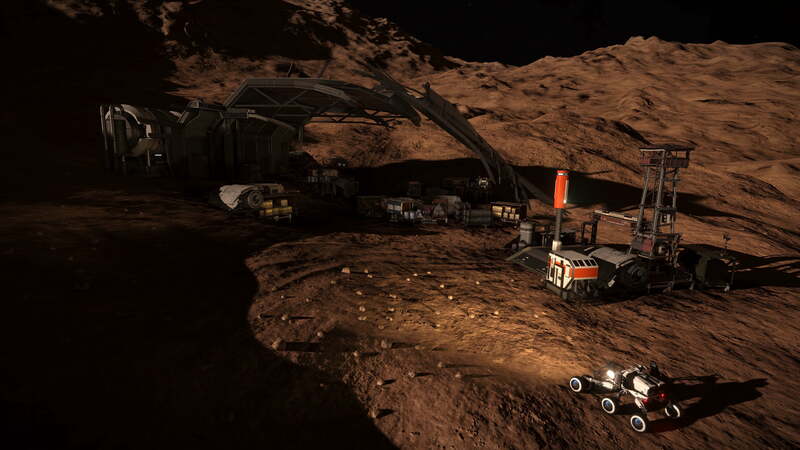 The can appear in systems without Ancient Ruins. 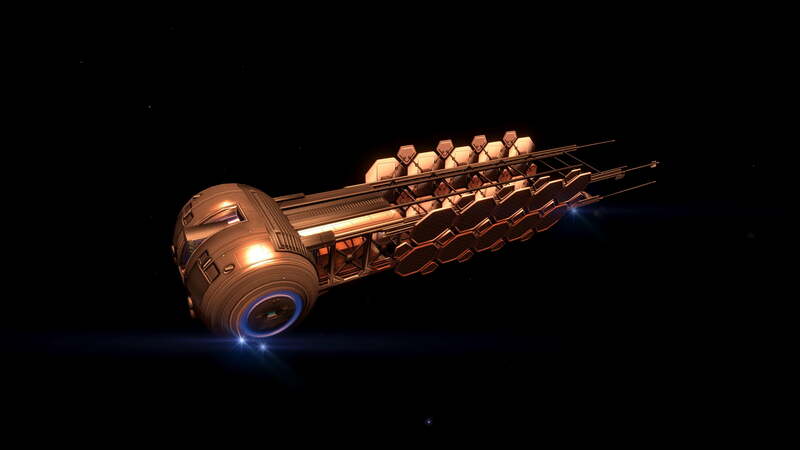 They can appear at any distance from the entry point, but you will only see then in the Navigation Panel within 1000ls. 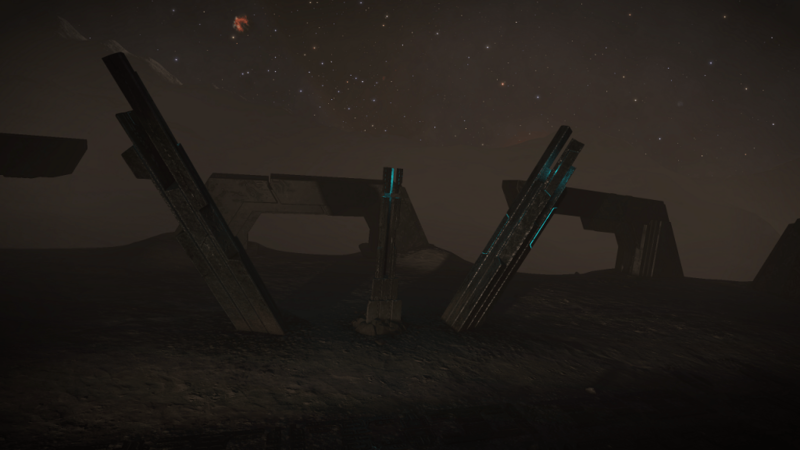 It is worthwhile to visit known Ancient Ruins to see if there is a Guardian Structure nearby. 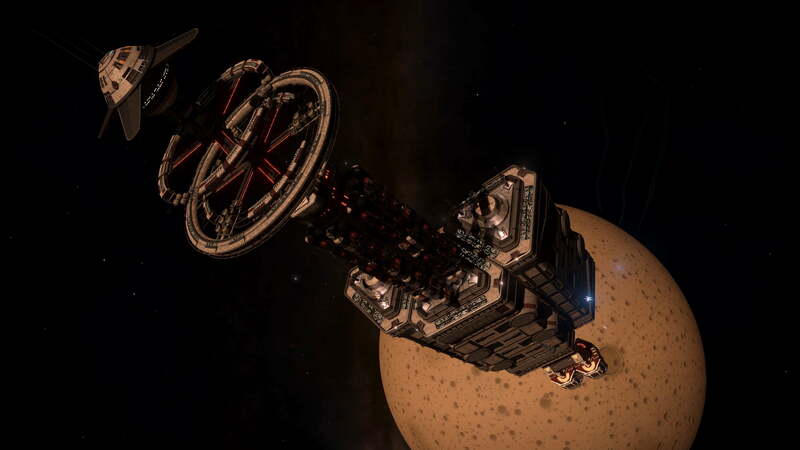 Canonn are recording the locations of the new structures, and you can submit new locations (link on the first page). Look for entries in the ‘Sites’ tab of type ‘structure’. 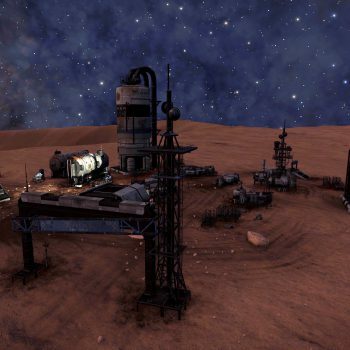 If you’re looking for particular Blueprints then check the ‘Scratch’ page. There is also a map of where they have been found – Guardian Structures currently shown as ‘structure’. 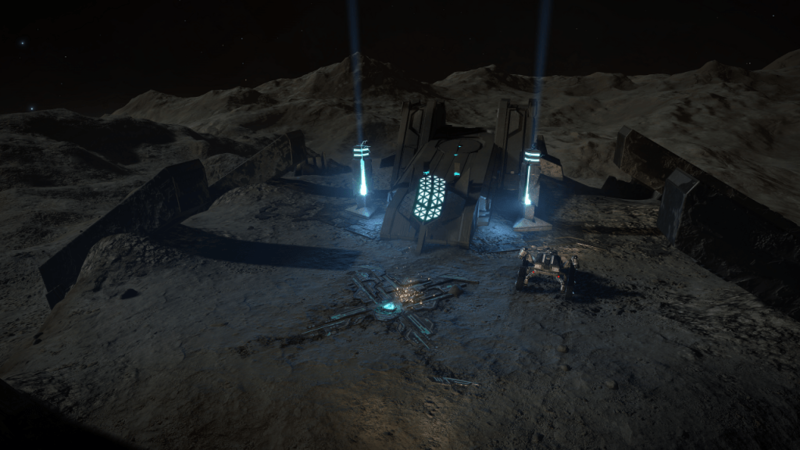 There are multiple site layouts, Guardian Structures appear more varied than the Ancient Ruins. 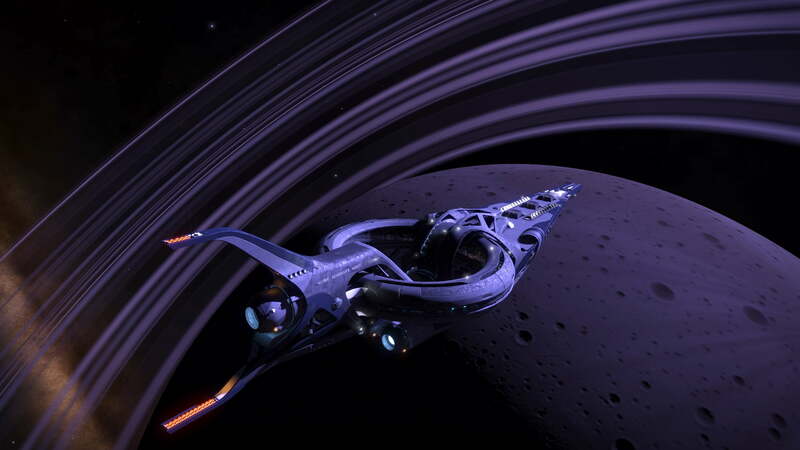 They are also in more mountainous areas – it can be difficult to land nearby in larger ships. There are features that look like bridges and doors. The ten different layouts tiny, small, and medium have been mapped by Zebarmy and Steve Arthur, and mapping of obelisks is in progress. These are part of the Ram Tah mission, and are described there. These appear from locations in the site, denoted by small rock piles, often near active obelisks. Ram Tah has a good introduction. https://canonn.science/wp-content/uploads/2018/03/GC14.mp3 It is easiest to destroy them using the turret view and sniping from a distance. 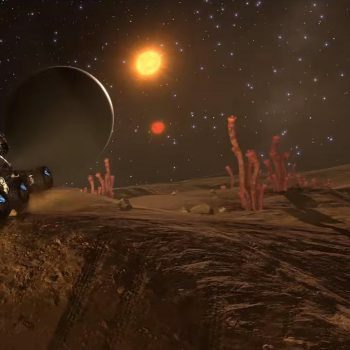 Sentinels have missile attacks and kinetic attacks that will move your SRV. There are usually multiple per site (more can spawn as you interact with the site). It is usually advisable to destroy them before further investigation. When you destroy them you they will drop Guardian materials you can harvest. 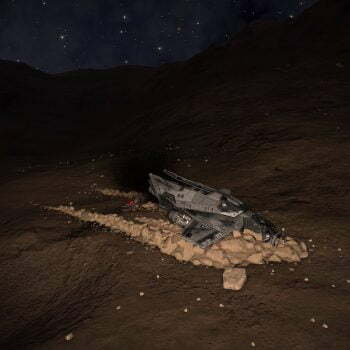 Point Defence on your ship is also useful, as it will attempt to defend you (even in your SRV) against missile attacks from Sentinels if you are within range. These are pillars, usually at an angle, that contain three targetable panels. 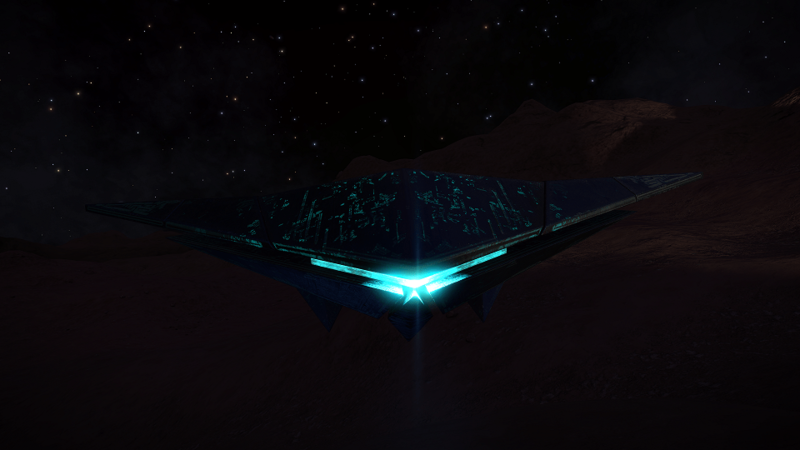 There are also panels on other structures which glow blue and are targetable. Shoot them to get materials. Pylons initially appear as triangles on the ground that are easy to miss. There can be up to six on a site. There are two near the Databank – when you approach they will rise out of the ground. After this has been done then other pillars can be raised across the site. 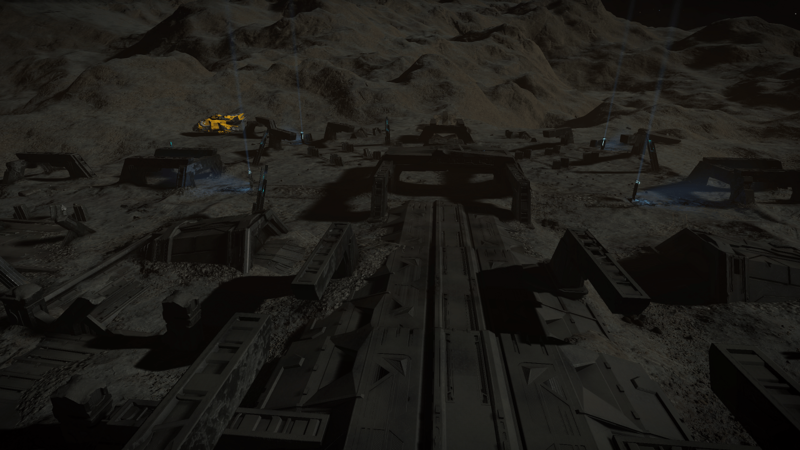 When the initial pillars rise extra Sentinels will spawn. Note the blue light. 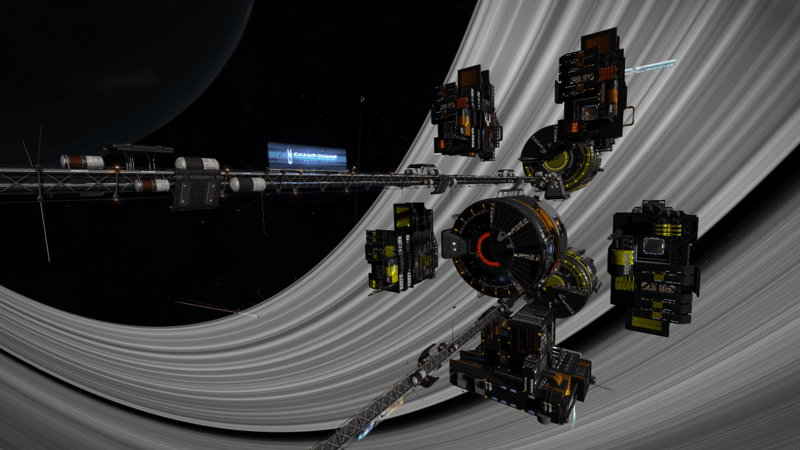 You can shoot the pylons with your SRV to charge them. Once charged they send a beam of light into the sky. A timer will start. At this point more sentinels may appear. To activate the site you must charge all pylons within the time limit. The time increases as you charge more pylons. The best way to do this is to find and raise all the pylons and remove any sentinels. Then charge all the pylons. Once the pylons are charged you can interact with the Databank. Not all sites have pylons. This is a structure usually situated in a raised platform near the centre of the site. This is activated by charging the pylons. Once the pylons are charged you can drop a specific item (see below) in front of the Databank and it will activate. Datalink Scan the resulting sphere to get Blueprints that are used at Tech Brokers for unlocking various items for sale. 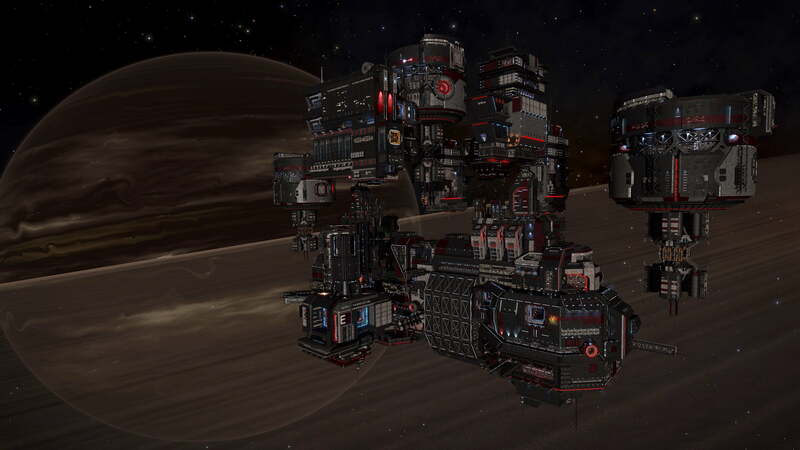 There are several types of blueprint available (Module, Weapon and Vessel at the moment). The type of blueprint is determined by the site layout, so a ‘Bear’ will always give Weapon, ‘Turtle’ will always gives Module, etc. 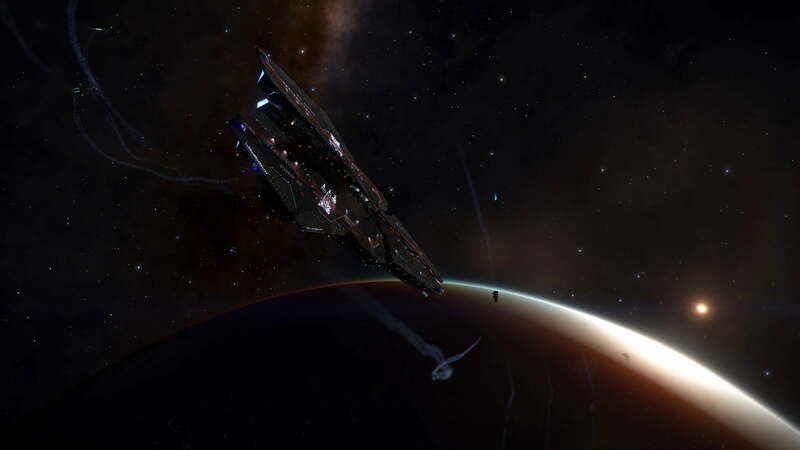 For Databank activation Weapon and Module blueprints require an Ancient Relic (available on the site, shoot one off a relic tower), Vessel Blueprints require an Ancient Key, which is available from Guardian Beacons, so are best collected beforehand. 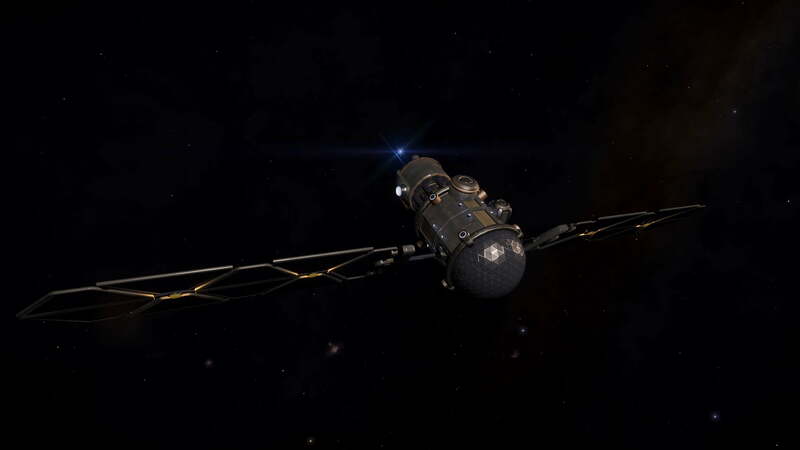 Ancient Keys can be used at any suitable site, not just the location that the Beacon gives you. Not all sites have data-banks. 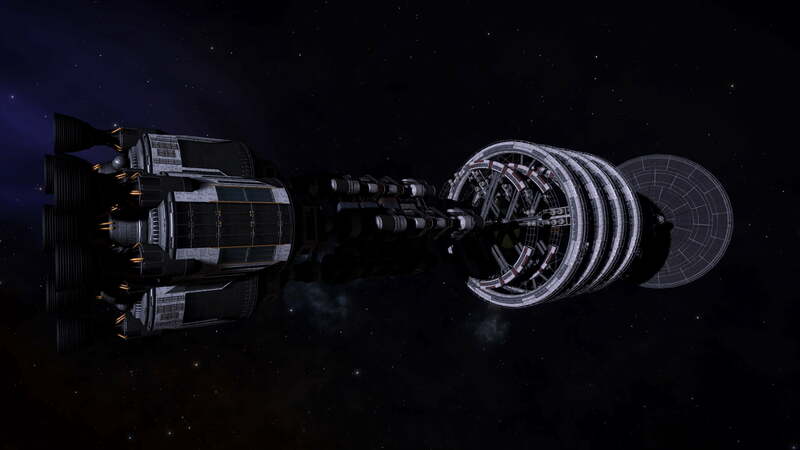 Guardian Structure Databank before activation. Note the blue spot on the floor where the relic should be placed.